The first post office in Buhler was established in 1888. Buhler was primarily inhabited by Mennonite families that had emigrated from Russia during the 1880s. In September 2012, the City of Buhler received a letter from the Freedom from Religion Foundation regarding a complaint about perceived constitutual violations about the city seal having a cross in it. In November 2012, the city stated that every legal opinion it had received indicated the city has no supportable case in the event the it was sued to legally force us to remove the seal and sign. If the city lost, it would be obligated to pay all the legal fees of the prevailing party. The city decided to hold a contest in January 2013 to redesign the city seal without specific reference to religion. The median age in the city was 41.1 years. 26.8% of residents were under the age of 18; 6.8% were between the ages of 18 and 24; 20.9% were from 25 to 44; 23.3% were from 45 to 64; and 22.2% were 65 years of age or older. The gender makeup of the city was 47.2% male and 52.8% female. As of the census of 2000, there were 1,358 people, 478 households, and 371 families residing in the city. The population density was 2,312.5 people per square mile (888.7/km²). There were 521 housing units at an average density of 887.2 per square mile (340.9/km²). The racial makeup of the city was 98.45% White, 0.15% African American, 0.29% Native American, 0.07% Asian, 0.37% from other races, and 0.66% from two or more races. Hispanic or Latino of any race were 1.18% of the population. There were 478 households out of which 38.7% had children under the age of 18 living with them, 70.3% were married couples living together, 5.9% had a female householder with no husband present, and 22.2% were non-families. 20.7% of all households were made up of individuals and 9.8% had someone living alone who was 65 years of age or older. The average household size was 2.69 and the average family size was 3.11. In the city, the population was spread out with 28.6% under the age of 18, 6.3% from 18 to 24, 25.6% from 25 to 44, 18.8% from 45 to 64, and 20.8% who were 65 years of age or older. The median age was 38 years. For every 100 females, there were 86.5 males. For every 100 females age 18 and over, there were 85.5 males. The median income for a household in the city was $44,107, and the median income for a family was $50,598. Males had a median income of $31,976 versus $20,592 for females. The per capita income for the city was $18,278. About 1.1% of families and 1.4% of the population were below the poverty line, including 1.8% of those under age 18 and 2.3% of those age 65 or over. The Buhler government consists of a mayor and five council members. The council meets the last Tuesday of each month at 7 pm. Buhler High School, Grades 9 to 12. Buhler Grade School, Grades PreK to 6. Katharina Schellenberg, Mennonite medical missionary. Hoffnungsau in Kansas; A.J. Dyck; Mennonite Life; October 1949. ^ "Kansas Post Offices, 1828-1961". Kansas Historical Society. Retrieved 22 June 2014. ^ Parker, Tammy (Summer 2005). "Education and Ethnicity: The Relationship between Russian Mennonites and School District Formation in Buhler and Goessel, Kansas". Journal of American Ethnic History. 24 (4): 34–69. JSTOR 27501634. ^ Letter to Mayor Of Buhler; Freedom From Religion Foundation; September 14, 2012. ^ Buhler's City Seal; Mayor Daniel Friesen; November 23, 2012. 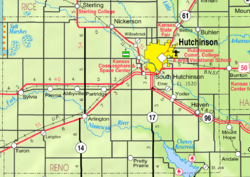 ^ Cross on Buhler signs spur complaint; The Hutchinson News; November 23, 2012. ^ City of Buhler sign must go because of lawsuit threat; KSN tv; November 27, 2012. ^ Buhler decides to seek new city logo; The Wichita-Eagle; November 28, 2012. ^ "MBHC: Profiles: Katharina Schellenberg". www.mbhistory.org. Retrieved 25 August 2018. Wikimedia Commons has media related to Buhler, Kansas.